Forty years ago, when our nation celebrated its BiCentennial in 1976, every town, city, county, and state in America was encouraged to participate by celebrating its own history in some special way. Corte Madera responded by forming the Corte Madera Heritage & History Group (CMH&HG) as a 501 (c) (3) nonprofit charitable organization whose mission was to research and assemble all the stories, photographs, and other materials that could document our town's history. Led by Gerrie Griffith Reichard, volunteers collected hundreds of photographs and numerous histories written by various people, and also onducted their own research to sort out the sometimes conflicting versions of local history. This archival collection, which was later turned over to the Corte Madera Community Foundation, was edited and published in a book, A History of Corte Madera, in 2002. 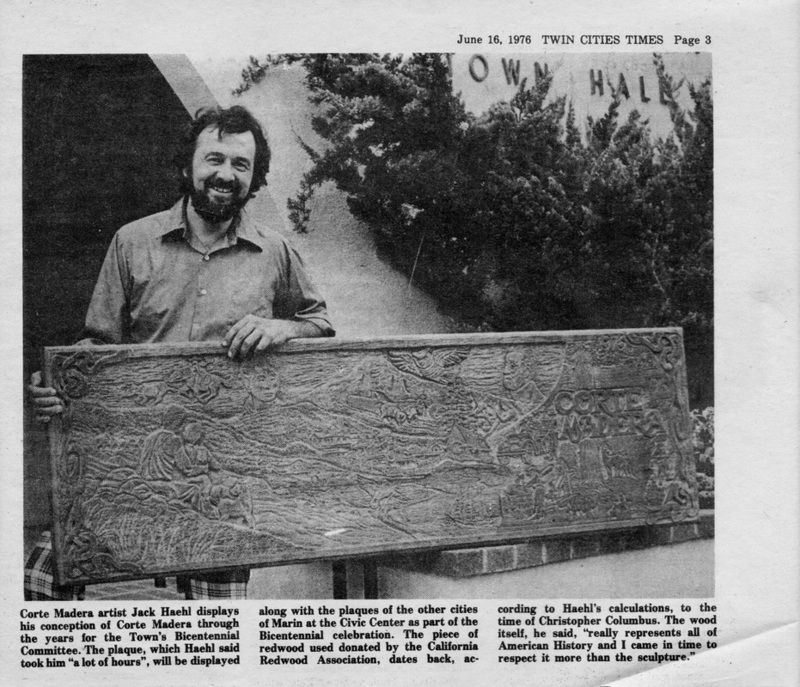 Meanwhile, back in 1976, the California Redwood Association gave each city and town in Marin County a large, thick section of heart redwood from an ancient tree in Northern California for the purpose of creating a commemorative plaque that represented their own community’s local history. 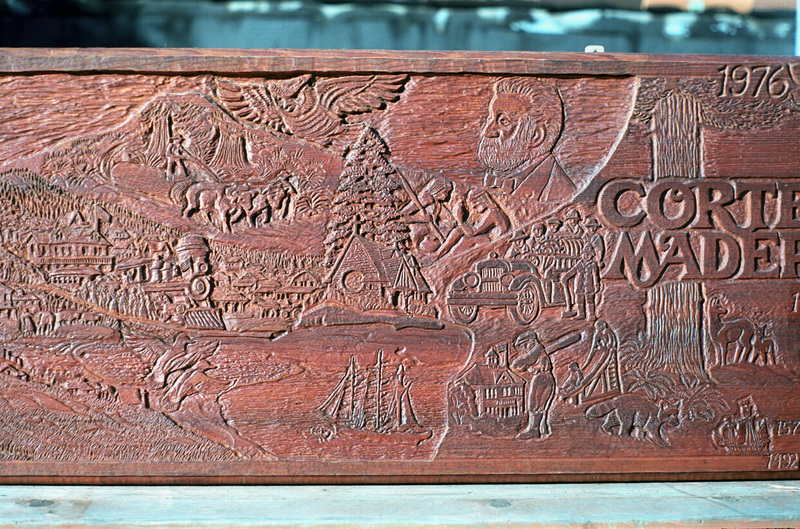 Corte Madera’s plaque was designed and carved by Jack Haehl, who included iconic scenes from historic photographs of the town and its early settlers. All of the commemorative plaques were permanently installed high on a wall in the foyer of the Marin County Civic Center Auditorium, where they can be seen today. Unfortunately, at some point, the facilities manager approved putting a dark stain on the beautiful, warm, natural redwood, and it obliterated the fine shadow patterns that made the carving stand out. Corte Madera's plaque is also positioned where it doesn't get adequate lighting. 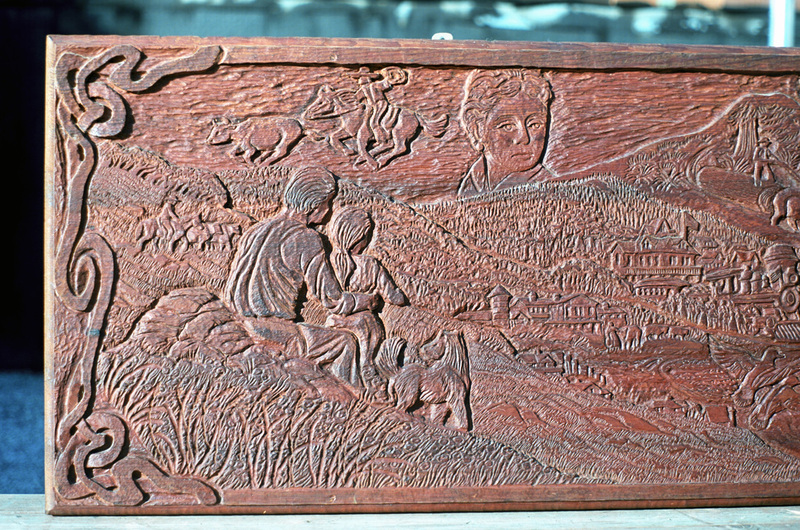 The photographs shown below, taken before the plaque was moved to the Civic Center, show close-up views of the plaque at the time it was carved in 1976. A clipping that shows the plaque as a whole, along with a narrative explanation of the various iconic images on the plaque, follows at the bottom of the photographs. 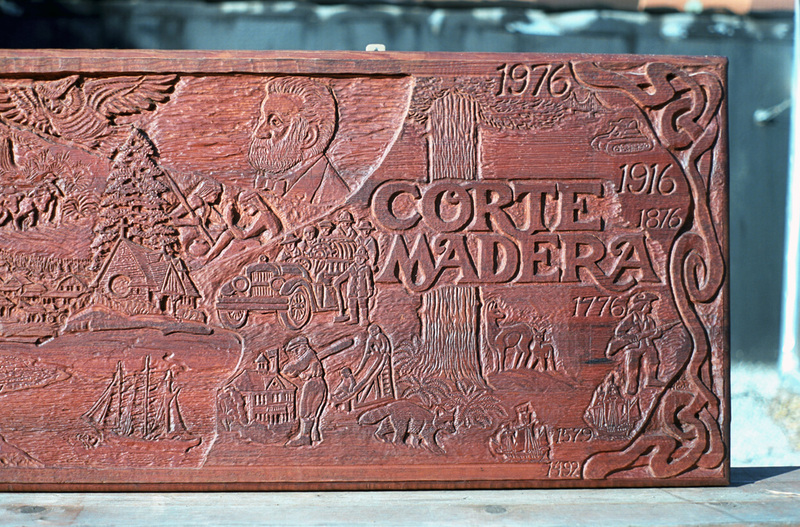 Corte Madera 's commemorative plaque was designed and carved by Jack Haehl, a teacher in the Terra Linda High School art department and a thirteen-year resident of Corte Madera. Haehl, who donated his work to the town, has had several major sculptural commissions, including the 18-ft. redwood chancel cross in the First Presbyterian Church of San Rafael and a wall relief for United California Bank in San Francisco. For the past four years Haehl has also been the crafts coordinator for the Marin County Fair. 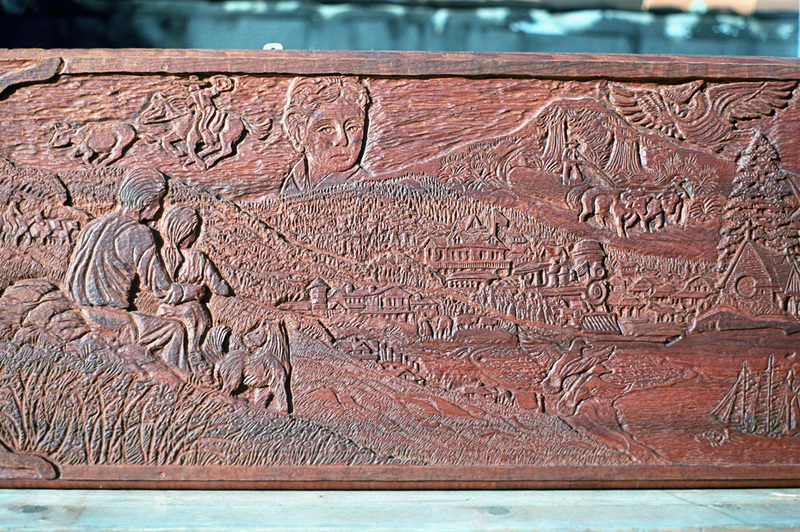 The large 22" x 72" x 2" slab of redwood used in the carving of this historical plaque was donated to the Marin Bicentennial Com­mission by the California Redwood Association. It is old-growth, clear, all-heart redwood harvested in Humboldt County, and a count of the rings (dark grain lines) shows that at least 500 years went into the growth of the tree. Redwoods of this size and age were also found in the Corte Madera area during the early part of the nineteenth century. 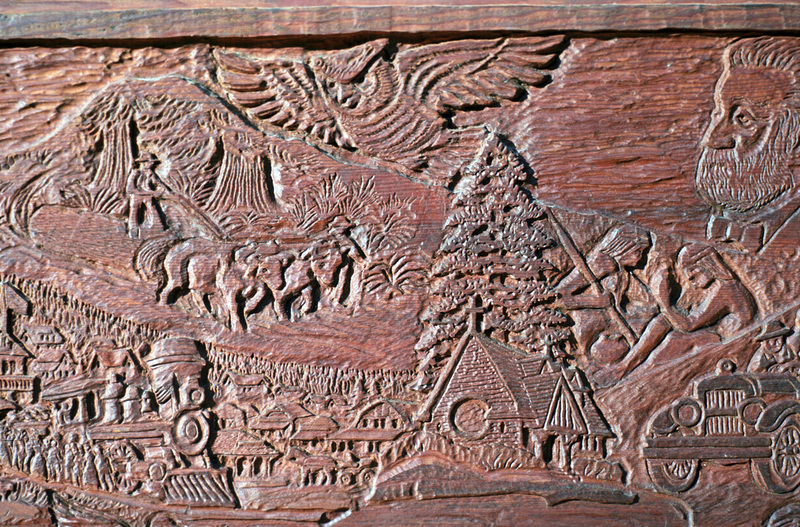 The dates and symbol on the right side of the plaque relate to the grain lines depicting the approximate times certain historic events occurred relative to the life of the particular redwood tree from which this wood was cut. Since the grains are closer together when the tree is young, the wood nearest the center of the tree 'compresses ' these time periods, as can be seen at the bottom, where the year 1492 marks the discovery of America by Columbus in his ship, the Santa Maria. The next mark represents the year 1579, when Sir Francis Drake, on the Golden Hinde, claimed this area for England. The American Revolution of 1776 is marked, as is our country's centennial in 1876. As the redwood tree grew older and larger the grain lines or rings were farther apart, and the sixty years between the incorporation of Corte Madera in 1916 and the present time are clearly marked. The father and child who are pictured atop a hill overlooking Corte Madera are thought to be gazing beyond the present-day town with its orderly streets and modern homes into the past history of the community as represented by symbols of its colorful and interesting heritage. 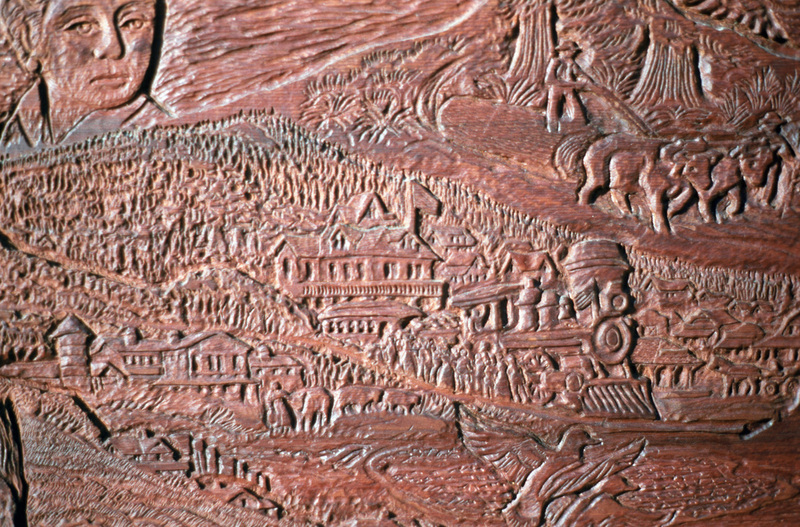 The various elements of the plaque are set into a background depicting Corte Madera‘s magnificent natural setting within a series of ridges sloping down to the bay, with Mt. Tamalpais rising majestically behind the town. The first inhabitants of the place were the Miwok Indians who for centuries populated the fertile lands where the foothills swept across the marshes. These indigenous clam-diggers gave way in the early 1800's to the Spanish colonists who established missions and fortifications in Marin. Spain lost its hold on California in 1822 and within a few years the Mexican government began turning over vast holdings of mission lands to private citizens whose service to the Mexican republic had earned them sizable grants.The Miwok population was decimated by exposure to diseases brought in by foreigners, and the native Miwoks were eventually wiped out altogether. Ancient groves of redwoods on the slopes of the ridges provided colonists with a wealth of timber, which was cut to build a presidio guarding the entrance to San Francisco Bay. Forest giants with trunks as much as five feet in diameter were later felled and dragged by oxen to the banks of Corte Madera Creek, where they were shipped across the bay to a small settlement still known as Yerba Buena. The area was called Rancho Corte Madera del Presidio, meaning the place where wood was cut for the presidio. The first land grant north of San ·Francisco was made to a dynamic young Irishman, John Reed, who obtained one league (nine square miles) extending from Raccoon Straits to Arroyo Holon, in an area known today as Baltimore Canyon. In Mill Valley, Reed built the first sawmill in California and supplied the presidio with cordwood and lumber. His marriage to Hilaria Sanchez, daughter of the commandante of the presidio, came at the beginning of an era that made ranchero life legendary. Hilaria Sanchez Reed was widowed at an early age, but she and her four children valiantly confronted the struggles resulting from California 's occupation by Fremont' s armies. Statehood brought changes in property laws that clouded certain Mexican land grant titles and Hilaria Reed lost the lands lying west of Alto Hill and San Clemente Creek, lands thereafter known as the ‘Reed Sobrantes ' or ‘Reed leftovers '. 160-acre sections of this land were claimed under the National Homestead Act by settlers who took up farming and ranching, only to find that San Francisco speculators had obtained quit­claim deeds to their property from the Widow Reed after she had successfully asserted her rights before the U .S. Lands Commission in 1854. These land speculators, Coleman, Forbes and Valentine, took all the homesteaders through prolonged litigation in an effort to force them off the land. While some settlers were able to purchase quitclaim deeds from the speculators, others could not, although a record of each claim still exists to show the location of the early homesteads. One settler whose heirs finally obtained title to their old 'Owl 's Wood' homestead for $2000 in gold was Captain John L. Von Reynegom from Philadelphia, who brought his sailing ship, the Linda, around Cape Horn in 1848 only to have all his hands skip overboard in a rush to the gold country. Left aboard with his wife and his daughter, Amelia, Von Reynegom beached his ship near Corte Madera and staked a claim for 160 acres between Mt. Tamalpais and the bay, which he called Owl's Wood. The old town of Corte Madera was founded on the lands of Owl 's Wood many years later. The captain 's daughter, Amelia, was soon swept off her feet by a prominent young San Francisco attorney, Frank Morrison Pixley. After coming west from New York by wagon train in 1848, Pixley launched a career that was to lead historians to write, "Pixley probably exerted a more commanding influence upon the public mind of California in his time than any other man." During vigilante days Pixley served as San Francisco city attorney and went on to the state assembly and the office of state attorney general during the Civil War. Although the Pixleys lived in a fashionable mansion in Cow Hollow, they retreated often to the tranquility and ambience of Owl 's Wood, where Pixley summoned the muse that led to his founding a literary magazine, the San Francisco Argonaut, that carried the writings of Mark Twain and Ambrose Bierce among others. Pixley created a gentleman 's country estate out of his father-in-law's homestead and acquired an adjoining 30-acre property known today as Christmas Tree Hill. The coming of the railroad in 1894 marked the beginning of what we know today as Corte Madera. Chinese laborers cut a tunnel underneath Corte Madera Ridge, opening the way for hundreds of San Franciscans to enjoy the sunshine and balmy breezes on weekends. Vacation cottages soon dotted the slopes within easy walking distance from the railroad station and, within a few years, roads and 'villa homesites 'were laid out in the hills. The area around the train station was soon a bustling center of activity complete with a three-story hotel, a livery stable, and a post office--buildings which exist in the Village Square to this day. An early picture of the square shows crowds of people arrayed to greet friends arriving from the city via ferry and train, children come to share the excitement of the shiny black steam locomotive chugging to a whistling stop, and entrepreneurs offering lots on the hill for as low as $1 per week. One of the first community projects was the building of churches, one Episcopal and one Presbyterian, on land donated by the Pixley family. Holy Innocents, with its grand old evergreen tree, which has long marked the Christmas season with colored lights, stands prominently to this day in the Village Square. For generations, Corte Maderans shopped at Buckley & Company, the grocery store extraordinaire, located in the former livery stable building now known as Corte Madera Hardware. From 1911 until 1957 Mert Bain and his sister-in-law, Eda Nagel, served the families of the town. Mert Bain himself made deliveries each morning, first with a familiar horse and wagon, later with an International Harvester truck with a shining brass nameplate. A vivid picture of Corte Madera in its formative years is found in the eighteen issues of "The Booster " published in 1913-14 by the Corte Madera Improvement Club, describing the individuals and organizations who made their mark in the growth of a community character and identity during the years just before incorporation . The scroll-like borders of the plaque are patterned after the scrolls decorating the covers of "The Booster”. Community needs were overseen by elected directors ·of the sanitary district, fire commission, and school board, as well as by the many public-spirited citizens who comprised the Corte Madera Improvement Club, the Women’s Club, and the growing business community. Amenities such as street lights and paving were provided by an endless series of festive fund-raising 'socializers' and the community's motto was "Pull Together, Boost Together, Stick Together”. A vigorous volunteer fire department was formed in 1908 and provided fire protection with two hosecarts and a chemical engine. Corte Madera 's first fire truck was a small Chevrolet Pope Hartford, pictured with men of the fire brigade in front of Engine House #1 in 1913. A bond issue was approved by voters in 1928 for purchase of an American LaFrance 500 gpm pumper--the pride and glory of the volunteer department for years. Marin County 's second schoolhouse was built in Corte Madera in 1872 and the building is still is use today as a private home. The old Larkspur-Corte Madera School that replaced it was built on the cornfields of Owl’s Wood in 1908. Pictures from that era show it standing grandly alone in the empty vale between Corte Madera Ridge and Palm Hill, an imposing two-story frame structure topped by a bell tower and surrounded by a picket fence. One boy who, in the early part of the century, took his swing at bat for the camera, was Lloyd Rea, son of Louis and Louise Rea who owned the old hotel and Rea's Pavilion, where community get-togethers were held and weekly movies shown. Lloyd represents the generations of children who have grown up in Corte Madera, enjoying the sports and recreation programs that have long been an important part of community life. The foresight and hard work of the townspeople in providing a beautiful town park where such activities can take place is noted by the children shown at play. Meadowsweet Farms Dairy, where the best dairy cows in Marin were said to produce milk of unsurpassed quality, brought visitors from other parts of the country just to see the exceptional operation developed by Frank Keever, who devised an ingenious system of floodgates to drain the marshes below Meadowsweet for pastureland. Years later, Charlotte Tobler Conow, who had raised her family here in the early days, converted the old dairy building into apartments. The property now houses the Meadowsweet School. A charming 1919-era photograph of Charlotte with her cow, Daisy, was incorporated into the Meadowsweet Farms scene. If the coming of the railroad brought one great change to Corte Madera, enabling hundreds of San Franciscans to make an easy commute from their new homesites here to their work in the city following the wake of the great earthquake, then the second great change must be attributed to the construction of the Golden Gate Bridge that brought a post-war influx of people seeking homesites where orchards and pastures stood. A final note: The aspects of Corte Madera history incorporated into this commemorative plaque comprise only a few of those that might well have been included . Limitations inherent in any work of this sort mean that many people, places and episodes are left out, which should in no case be interpreted to mean that the contributions of some were necessarily more meaningful than others . The entertwining of all the forces which people and events. and nature itself weave into the flow of time and place becomes a part of the heritage of all those who come after, and this is as it should be.